Rotator cuff disease is one of the most prevalent shoulder disabilities especially in the elderly population. Tear progression is significantly greater in the symptomatic patients than in the asymptomatic ones. From these aspects, shoulder surgeons interpret surgical indications and counsel patients regarding the risk of non-operative treatments. However, there were a few reports that pain and duration of symptoms were not strongly associated with severity of rotator cuff tears, and non-operative management with physical therapy was effective. There have remained controversies for the treatment of rotator cuff tears. A 59-year-old man with a sedentary work life experienced right shoulder pain with abduction at night. However, the pain kept worsening after two months, and he finally visited our clinic three months after the onset of pain. Magnetic resonance imaging in the coronal and axial planes showed effusion around the subacromial and subcoracoid bursae and joint-side tear of the supraspinatus tendon. A range of motion in the right shoulder was severely restricted at the initial visit of our clinic. After sufficient rehabilitation, the symptoms were not changed and an arthroscopic rotator cuff repair was scheduled. However, during waiting for surgery, he felt something popped in the right shoulder while wearing a jacket. Immediately after this, pain during motion and at night decreased, and he experienced no difficulty with activities of daily living and the surgery was cancelled. This is the first case with a recovery of range of motion and a decrease in pain after progression of a supraspinatus tendon tear. Keywords: Supraspinatus tendon tear, Rotator cuff disease, Rotator cuff tear, Coracohumeral ligament, Adhesions, Shoulder. © 2019 Hagiwara et al. Rotator cuff disease is very common in the elderly population and it is one of the most prevalent shoulder disabilities. Its prevalence varies widely with population characteristics; however, increasing age is associated with rotator cuff pathology [1Yamamoto A, Takagishi K, Kobayashi T, et al. The impact of faulty posture on rotator cuff tears with and without symptoms. J Shoulder Elbow Surg 2015; 24(3): 446-52. [http://dx.doi.org/10.1016/j.jse.2014.07.012] [PMID: 25441565] , 2Yamaguchi K, Ditsios K, Middleton WD, Hildebolt CF, Galatz LM, Teefey SA. The demographic and morphological features of rotator cuff disease. A comparison of asymptomatic and symptomatic shoulders. J Bone Joint Surg Am 2006; 88(8): 1699-704. [http://dx.doi.org/10.2106/JBJS.E.00835] [PMID: 16882890] ]. Because high-quality evidence is not available to help guide treatment of patients with rotator cuff pathologies [3Pedowitz RA, Yamaguchi K, Ahmad CS, et al. Optimizing the management of rotator cuff problems. J Am Acad Orthop Surg 2011; 19(6): 368-79. [http://dx.doi.org/10.5435/00124635-201106000-00007] [PMID: 216 28648] ], there remains considerable controversy among shoulder surgeons regarding optimal management of rotator cuff disease with significant variations [4Dunn WR, Schackman BR, Walsh C, et al. Variation in orthopaedic surgeons’ perceptions about the indications for rotator cuff surgery. J Bone Joint Surg Am 2005; 87(9): 1978-84. [http://dx.doi.org/10.2106/JBJS.D.02944] [PMID: 16140812] ]. Many orthopaedic surgeons would agree that rotator cuff disease is influenced by biologic factors and mechanical stress [5Hsu J, Keener JD. Natural history of rotator cuff disease and implications on management. Oper Tech Orthop 2015; 25(1): 2-9. [http://dx.doi.org/10.1053/j.oto.2014.11.006] [PMID: 26726288] ]; however, genetic factors are also strongly associated with its development [6Harvie P, Ostlere SJ, Teh J, et al. Genetic influences in the aetiology of tears of the rotator cuff. Sibling risk of a full-thickness tear. J Bone Joint Surg Br 2004; 86(5): 696-700. [http://dx.doi.org/10.1302/0301-620X.86B5.14747] [PMID: 15274 266] -8Gwilym SE, Watkins B, Cooper CD, et al. Genetic influences in the progression of tears of the rotator cuff. J Bone Joint Surg Br 2009; 91(7): 915-7. [http://dx.doi.org/10.1302/0301-620X.91B7.22353] [PMID: 19567 856] ], which could make it difficult for surgeons to come to a consensus on its management. A longitudinal study for three years on 50 patients with asymptomatic rotor cuff tears revealed that 36% (18/50) developed symptoms, and tear progression was significantly greater in the symptomatic group than in the asymptomatic group [9Moosmayer S, Tariq R, Stiris M, Smith HJ. The natural history of asymptomatic rotator cuff tears: A three-year follow-up of fifty cases. J Bone Joint Surg Am 2013; 95(14): 1249-55. [http://dx.doi.org/10.2106/JBJS.L.00185] [PMID: 23864172] ]. Furthermore, the development of pain in patients with asymptomatic rotator cuff tears was associated with tear progression [10Mall NA, Kim HM, Keener JD, et al. Symptomatic progression of asymptomatic rotator cuff tears: A prospective study of clinical and sonographic variables. J Bone Joint Surg Am 2010; 92(16): 2623-33. [http://dx.doi.org/10.2106/JBJS.I.00506] [PMID: 21084574] ]. Tear enlargement occurred in more severe types and there was development of pain in a time-dependent manner [11Keener JD, Galatz LM, Teefey SA, et al. A prospective evaluation of survivorship of asymptomatic degenerative rotator cuff tears. J Bone Joint Surg Am 2015; 97(2): 89-98. [http://dx.doi.org/10.2106/JBJS.N.00099] [PMID: 25609434] ]. Considering these aspects, shoulder surgeons interpret surgical indications and counsel patients regarding the risk of non-operative treatment [5Hsu J, Keener JD. Natural history of rotator cuff disease and implications on management. Oper Tech Orthop 2015; 25(1): 2-9. [http://dx.doi.org/10.1053/j.oto.2014.11.006] [PMID: 26726288] ]. However, the Multicenter Orthopaedic Outcomes Network Shoulder Group reported that pain and duration of symptoms were not strongly associated with severity of rotator cuff tears [12Unruh KP, Kuhn JE, Sanders R, et al. The duration of symptoms does not correlate with rotator cuff tear severity or other patient-related features: a cross-sectional study of patients with atraumatic, full-thickness rotator cuff tears. J Shoulder Elbow Surg 2014; 23(7): 1052-8. [http://dx.doi.org/10.1016/j.jse.2013.10.001] [PMID: 24411924] , 13Dunn WR, Kuhn JE, Sanders R, et al. Symptoms of pain do not correlate with rotator cuff tear severity: a cross-sectional study of 393 patients with a symptomatic atraumatic full-thickness rotator cuff tear. J Bone Joint Surg Am 2014; 96(10): 793-800. [http://dx.doi.org/10.2106/JBJS.L.01304] [PMID: 24875019] ] and that non-operative management with physical therapy was effective, with 75% of patients experiencing relief for up to two years [14Kuhn JE, Dunn WR, Sanders R, et al. Effectiveness of physical therapy in treating atraumatic full-thickness rotator cuff tears: a multicenter prospective cohort study. J Shoulder Elbow Surg 2013; 22(10): 1371-9. [http://dx.doi.org/10.1016/j.jse.2013.01.026] [PMID: 23540577] ]. Function and pain are not always associated with rotator cuff tears, and other approaches should be considered to provide better treatment to patients with shoulder problems. This is the first case report regarding recovery of range of motion and decrease in pain after progression of a supraspinatus tendon tear. A 59-year-old man with a sedentary work life experienced right shoulder pain with abduction at night. He had no past history of systemic disease or symptoms. He visited a hospital complaining of difficulty in using the arm and in wearing trousers. He was prescribed non-steroidal anti-inflammatory drugs and was administered an injection of hyaluronic acid into the glenohumeral joint. However, the pain kept worsening after two months, and he finally visited our clinic three months after the onset of pain. X-ray films taken on his initial visit to our clinic appeared normal, but Magnetic Resonance Imaging (MRI, T2 weighted image) in the coronal and axial planes showed effusion around the subacromial and subcoracoid bursae and joint-side tear of the supraspinatus (SSP) tendon (Fig. 1A-C ). However, a sagittal MRI (T1 weighted image) revealed no thickening of the coracohumeral ligament (CHL) and obliteration of the subcoracoid fat triangle (Fig. 2A ). Range Of Motion (ROM) in the right shoulder was severely restricted on his initial visit to our clinic Table 1. Magnetic resonance imaging of the right shoulder (T2 weighted image). Axial image: A and D, Coronal image: B and E, Sagittal image: C and F. A-C: initial visit, D-F: just after the symptom restoration. Effusion around the subcoracoid space and anterior labrum were observed (A). Joint-side tear of supraspinatus tendon and effusion around subacromial space (B and C). Full-thickness tear of the supraspinatus tendon without effusion was observed (D-F). Sagittal magnetic resonance imaging of the right shoulder (T2 weighted image). A: initial visit, B: just after the symptom restoration. Obliteration of the subcoracoid fat triangle and the thickened coracohumeral ligament (arrowhead) were not observed. Changes of the range of motion. The American Shoulder and Elbow Surgeons (ASES) score was 60, the University of California at Los Angeles (UCLA) shoulder rating score was 18, and the Constant shoulder score was 68. Based on these findings, a preoperative diagnosis of joint-side tear of the SSP along with shoulder stiffness was made. Although physiotherapy, including stretching of the muscles around the shoulder girdle, thorax, spine, trunk, and hip joints, was undertaken for a total of 6 weeks at our clinic, there was no relief of pain or restoration of ROM. Therefore, an arthroscopic rotator cuff repair was scheduled. While wearing a jacket at two months after the initial visit, he felt something popped in the right shoulder. Immediately after this, pain during motion and at night decreased, and he experienced no difficulty with activities of daily living. Five days after the incident, he visited our clinic. The ROM significantly improved to almost full range (Table 1) and the ASES, UCLA, and Constant scores improved to 100, 35, and 96, respectively. MRI revealed enlargement of the supraspinatus tear and decrease of effusion (Fig. 1D-F ) without thickening of the CHL as well as the other joint capsule (Fig. 2B ). Because he had no difficulty with activities of daily living, surgery was ruled out and careful follow-up was continued. Based on conventional theory, the articular aspect of the anterior supraspinatus adjacent to the biceps tendon is the common location for degenerative tears [15Keyes EL. Observations on rupture of the supraspinatus tendon: Based upon a study of seventy-three cadavers. Ann Surg 1933; 97(6): 849-56. [http://dx.doi.org/10.1097/00000658-193306000-00007] [PMID: 178 66987] , 16Hijioka A, Suzuki K, Nakamura T, Hojo T. Degenerative change and rotator cuff tears. An anatomical study in 160 shoulders of 80 cadavers. Arch Orthop Trauma Surg 1993; 112(2): 61-4. [http://dx.doi.org/10.1007/BF00420255] [PMID: 8457412] ], propagating posteriorly into the supraspinatus and infraspinatus tendons [5Hsu J, Keener JD. Natural history of rotator cuff disease and implications on management. Oper Tech Orthop 2015; 25(1): 2-9. [http://dx.doi.org/10.1053/j.oto.2014.11.006] [PMID: 26726288] ]. However, analysis via ultrasonography of full-thickness tears revealed that an approximately 13- to 17-mm area posterior to the biceps tendon was most frequently involved and the most anterior aspect of the supraspinatus was involved only 30% [17Kim HM, Dahiya N, Teefey SA, et al. Location and initiation of degenerative rotator cuff tears: an analysis of three hundred and sixty shoulders. J Bone Joint Surg Am 2010; 92(5): 1088-96. [http://dx.doi.org/10.2106/JBJS.I.00686] [PMID: 20439653] ]. The 15-mm area posterior to the biceps tendon lies at the junction of the supraspinatus and infraspinatus tendons [18Mochizuki T, Sugaya H, Uomizu M, et al. Humeral insertion of the supraspinatus and infraspinatus. New anatomical findings regarding the footprint of the rotator cuff. J Bone Joint Surg Am 2008; 90(5): 962-9. [http://dx.doi.org/10.2106/JBJS.G.00427] [PMID: 18451386] ] and correlates with the middle of the “rotator crescent”, with the thinner and avascular tissues being compared with the “rotator cable” [19Burkhart SS, Esch JC, Jolson RS. The rotator crescent and rotator cable: an anatomic description of the shoulder’s “suspension bridge”. Arthroscopy 1993; 9(6): 611-6. [http://dx.doi.org/10.1016/S0749-8063(05)80496-7] [PMID: 8305096] ]. This area and the articular aspect of the supraspinatus in this case corresponded well with these anatomical findings. Severely restricted ROM in all planes is a feature of frozen shoulder. A thickened CHL at the rotator cuff interval has been recognized to be one of the most specific manifestations of frozen shoulder and the primary restraint against external rotation [20Ozaki J, Nakagawa Y, Sakurai G, Tamai S. Recalcitrant chronic adhesive capsulitis of the shoulder. Role of contracture of the coracohumeral ligament and rotator interval in pathogenesis and treatment. J Bone Joint Surg Am 1989; 71(10): 1511-5. [http://dx.doi.org/10.2106/00004623-198971100-00009] [PMID: 259 2391] ]. Furthermore, thickening of other parts of the joint capsule, including the inferior glenohumeral ligament, also restricts ROM in frozen shoulder. However, in this case, there were no specific findings on MRI with regard to thickening of the CHL, as well as the other joint capsule, and restriction of ROM was mainly with forward flexion and abduction, accompanied by pain. Impending rupture of the supraspinatus tendon at the bursal side was one of the most probable causes for pain. Furthermore, the restriction of ROM is supposed to be due to adhesion in the subacromial space, usually around the coracoacromial ligament, which is close to the site of the tendon tear. Together with the tendon rupture and release of adhesion in this case, decrease in pain and recovery of ROM could occur simultaneously. Postural abnormality is a strong predictor for rotator cuff tears and pain in the past, as opposed to pain currently being experienced, according to population-based studies [1Yamamoto A, Takagishi K, Kobayashi T, et al. The impact of faulty posture on rotator cuff tears with and without symptoms. J Shoulder Elbow Surg 2015; 24(3): 446-52. [http://dx.doi.org/10.1016/j.jse.2014.07.012] [PMID: 25441565] ]. Poor posture has been directly linked to a decrease in the subacromial space [21Gumina S, Di Giorgio G, Postacchini F, Postacchini R. Subacromial space in adult patients with thoracic hyperkyphosis and in healthy volunteers. Chir Organi Mov 2008; 91(2): 93-6. [http://dx.doi.org/10.1007/s12306-007-0016-1] [PMID: 18320381] ] and scapular kinematics [22Finley MA, Lee RY. Effect of sitting posture on 3-dimensional scapular kinematics measured by skin-mounted electromagnetic tracking sensors. Arch Phys Med Rehabil 2003; 84(4): 563-8. [http://dx.doi.org/10.1053/apmr.2003.50087] [PMID: 12690596] ] with increasing internal rotation of the shoulder [23Solem-Bertoft E. Painful shoulder disorders from a physiotherapeutic view: a review of literature. Crit Rev Phys Rehabil Med 1999; 11(3&4): 229-77., 24Ludewig PM, Cook TM. Alterations in shoulder kinematics and associated muscle activity in people with symptoms of shoulder impingement. Phys Ther 2000; 80(3): 276-91. [PMID: 10696154] ]. Postural correction is a very easy approach to recover ROM in the shoulder, but it failed in this case. Other mechanisms to alter the center of rotation of the glenohumeral joint should be considered. Although poor posture is caused by the natural process of aging, it could cause adhesion between the coracoacromial ligament and the rotator cuff tendons, especially the SSP tendon, due to increasing pressure and decreasing mobility in elderly people. Adhesion around the coracoacromial ligament is usually observed during arthroscopic rotator cuff repair and its release is necessary to regain ROM and could be an important factor [26Hagiwara Y, Sekiguchi T, Ando A, et al. Effects of arthroscopic coracohumeral ligament release on range of motion for patients with frozen shoulder. Open Orthop J 2018; 12(12): 373-9. [http://dx.doi.org/10.2174/1874325001812010373] [PMID: 30288192] ]. A stretching strain of the adhesion could cause pain. Furthermore, the internal rotation of the scapula decreases blood flow in the anterior humeral circumflex artery [25Hagiwara Y, Kanazawa K, Ando A, et al. Blood flow changes of the anterior humeral circumflex artery decrease with the scapula in internal rotation. Knee Surg Sports Traumatol Arthrosc 2015; 23(5): 1467-72. 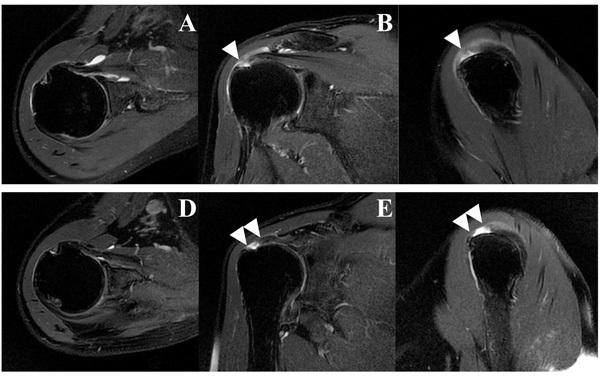 [http://dx.doi.org/10.1007/s00167-013-2823-2] [PMID: 24390057] ], which can influence rotator cuff tendon pathologies. Anterosuperior migration of the humeral head due to poor posture can increase the tension in the rotator cuff tendons, especially at the joint-side and its tensile strain could cause pain. These complex scenarios could explain rotator cuff pathologies and pain in the general population [1Yamamoto A, Takagishi K, Kobayashi T, et al. The impact of faulty posture on rotator cuff tears with and without symptoms. J Shoulder Elbow Surg 2015; 24(3): 446-52. [http://dx.doi.org/10.1016/j.jse.2014.07.012] [PMID: 25441565] ]. It is quite important to investigate these phenomena with longitudinal studies in the general population, but this case could have an implication on some of the above mentioned aspects. Careful follow-up is being further continued for evaluating changes in the size of the tendon tear and symptoms. Rotator cuff tears are not the only source of pain and retaining the center of rotation of the glenohumeral joint, including physiotherapy and releasing the adhesions, is an important therapeutic option. Solem-Bertoft E. Painful shoulder disorders from a physiotherapeutic view: a review of literature. Crit Rev Phys Rehabil Med 1999; 11(3&4): 229-77.